As water covers the prairie landscape this week, I’m sure that Winnipeg will soon be engaged in its annual battle with mosquitoes. Long before there was a Manitoba, the mosquito, which some jokingly call our “national bird,” was already well understood scientifically. This is thanks largely to the work of the great Dutch microscopist Jan Swammerdam (1637-1680), whose illustrations are shown here. Working with incredibly primitive microscopes, Swammerdam was among the first to document insect life cycles, and to carry out detailed studies of these creatures using dissections. What I find remarkable is how well his documentation stands up, more than 300 years later. As this work so abundantly shows, much careful observation had to be done before ideas about systematic classification could really develop. And much additional observation would be done, by many patient scientists, before a clear theory of evolution would be put forward. The edifice of natural science is constructed of many such building blocks. Sadly, and perhaps ironically, Swammerdam did not live to see the publication of some of his most important work. 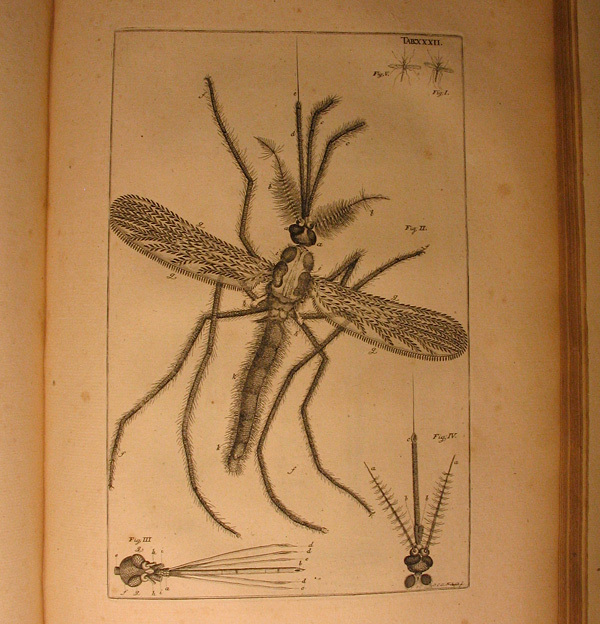 This man, who had subjected so many deceased mosquitoes to such indignities, met up with an extant one that happened to carry the malaria protist within its salivary glands. He died from this last contact with the insects, at the age of 43. The heads of insects and other features are depicted in exacting, almost painful detail. Even with a modern microscope it can be difficult to make out such features. These illustrations are from the first English edition of Swammerdam’s work, published in London in 1758, about 80 years after his death. Many thanks to my mother, Mary Young, for kindly passing her copy of this edition on to me; she herself had received it as a gift in the 1950s. I thought it only fair that I should share it with others, and this seems the best way to do it! Wonderful, Graham! Having had the privilege of seeing this volume “in the flesh”, I can attest to Swammerdam’s extraordinary accomplishments. 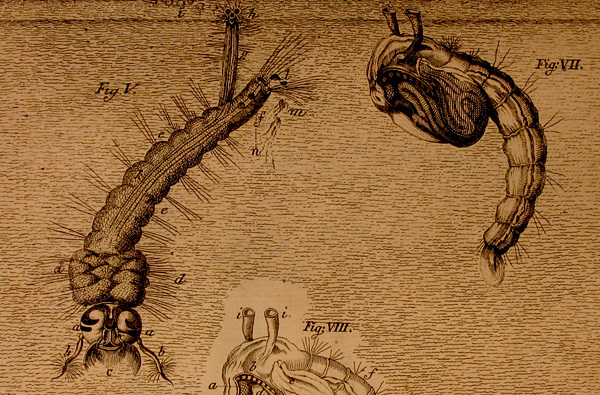 It is also a fine tribute to the skill and artistry of the engraver … scientific illustration beyond compare! People who contribite(d) to science with such pure spirit and sincerely only just to share or contribute normally do not have the fortune to enjoy the fruits that he/she planted over the years or any other reward that he/she should deserve. Swammerdam is an example, and I am quicky reminded about Marie Curie or Gideon Mantell (19th century English Paleontologist)or even Willian Smith. But sadly, people with ulterior intent, with private agenda,be it monetary or political, purportedly doing things for science, have (had) been, or appeared to be more successful. That’s how our world works…you must be crooked to be successful and famous. Dan, that is a very good point, and I tend to agree with you. Modern science rewards “success”, and success often goes to the opportunists. Those who do the most important scientific work are often not recognized for it at the time, but I don’t know of any remedy for that. I’m sorry Graham, there is no remedy for that. The world is run by a set of unwritten rules, which form an unwritten but firmly established hierarchy in the society. The businessman and politicians are at the top, and those who really work for the society and the world, and humankind, namely, teachers, researchers, scientists and so on, normally are at the bottom, their income also modest. People normally don’t give much respect to those who deserve more respect. I remember that even Galeleo had to cling to a politician (The Pope) to enable his scientific works to be published.